Greg Watermann, photographer and videographer for Pitbull and System Of A Down, spends his time documenting these artists’ lives and their experiences in the music industry. From traveling on the road, to entertaining millions of fans from the stage, to recording in the studio – Greg is the one who captures it all. Greg was an early convert to Sony Alpha full frame mirrorless cameras and he's never looked back. He also uses a collection of native mirrorless lenses designed for the Sony E mount. In addition to the nearly 50 E mount lenses Sony makes, optics manufacturers like Zeiss, Sigma, Tamron, Voigtlander and others have latched onto the Sony Alpha system with additional prime and zoom lenses designed to take advantage of the Sony system. We caught up with Greg to find out more about the cameras and lenses he uses to capture the many aspects of life as a Grammy-winning music artist. 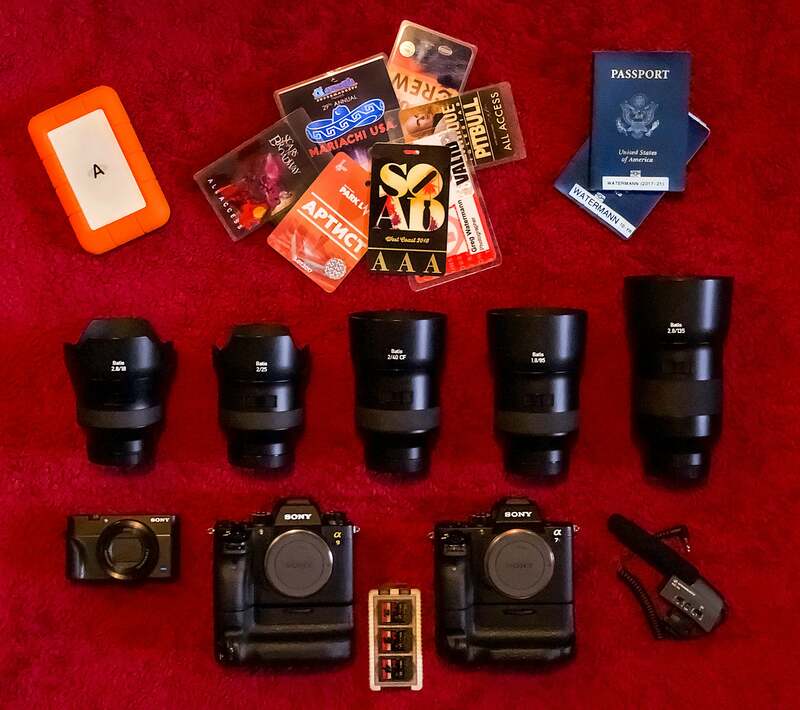 Greg Watermann, photographer & videographer for Pitbull and System Of A Down, shows us the Sony cameras and native mirrorless he uses to get his off the charts, all-access concert shots. Sony α9: The autofocus system is amazing. I’ve been manually focusing lenses for 40 years, but this camera is so good that I’ve switched over to autofocus. A concert environment is difficult for AF because of the fast action and constantly changing light. But the Face Detect, Continuous Tracking Eye-AF and Focus Tracking systems on the α9 solve those issues. Sony α7S II: This was my primary camera for three years until the α9 was released. It still has the best low light performance and I actually appreciate the 12.2 megapixel resolution, even for magazine cover portraits. Sony RX100 V: This camera is so good that I can do my job with it if necessary. For example, when I’m with my clients somewhere important (backstage at a TV show), security sees my camera bag and they tell us, “Sorry. No Pictures allowed here.” But they have no problem with a little point-&-shoot. Ha! Little do they know I’m capturing image-stabilized 4K video and WiFi’ing beautiful high-res photos to my phone! It’s also a great little camera to put anywhere for a timelapse. In addition to switching to Sony years ago, I've been a long-time user of Zeiss native mirrorless lenses. Zeiss now has a full set of matched autofocus prime lenses made for the Sony E-mount – and I used them all (18, 25, 40, 85, 135). These native mirrorless lenses, that is lenses specifically designed for the mirrorless system rather than requiring an adapter, offer a lot of advantages in performance, size and overall design. For photography of Grammy award-winning artists on stage and behind the scenes, those advantages make a huge difference. Zeiss Batis 40mm: The new Batis 40mm close-focus lens is my favorite. I could use this focal length for most of what I shoot; it’s very flexible. Zeiss Batis 18mm: The 18mm is great for impressive arena shots and works well when I'm flying with an artist on a private jet. Zeiss Batis 25mm: The 25mm looks beautiful in 16:9 when shooting video. Zeiss Batis 85mm: The 85mm is my go-to portrait lens in the studio and makes nice backgrounds on-stage. Zeiss Batis 135mm: The 135mm is best for outdoor portraits and longer concert shots. I love having all my lenses the same (color, contrast, handling, four of them with the same filter size). It makes for a more consistent experience - both when shooting and in editing. And by the way, they’re fantastic in the rain. Also, I use the Clear Image Zoom feature on my Sony mirrorless bodies. It turns all my primes into "2X zooms". Software Catalyst Browse: A free download from Sony that every photographer should learn. Use it to export a very detailed 40MB still image file from a frame of 4K video footage. The hybrid age is upon us. All-Access Credentials: Without one, you’re just shooting the same pictures as everyone else. Two Passports: Makes it easier to travel in one country while getting a visa for another. Sennheiser MKE-400 Microphone: Very low-profile. Extra SD cards: Always have plenty of memory cards and keep taking pictures. LaCie Rugged Thunderbolt 2TB Hard Drive: Everything gets backed up, twice. Manfrotto 190 Carbon Fiber Tripod: Very lightweight and packs easy. Apple 15″ MacBook Pro Retina: The newest version with the best screen. Tenba Shootout 24L Backpack: I’ve been using Tenba bags since 1982. B+W MRC Pro ND Filters: For shooting video at 1/50-sec outside. Giotto Rocket Air Blaster: I’ll use this between lens changes, but I only have my sensors fully cleaned by Sony Pro Support, 2-3 times a year. Learn more about Greg Watermann at www.gregwatermann.com.